Is your school district doing enough to fulfill your goal of improving Parent Engagement for Grades K-5? If not, then give your teachers and parents access to PodKeeper today. Contact us now! We set up an online "Pod" for every class, then they keep organized in a way that is simply not possible with a group email list. PodKeeper is very intuitive, so there's practically no learning curve. There's no download required, as teachers and parents can access PodKeeper from their computer, tablet or mobile phone. "PodKeeper keeps everyone highly engaged. The organizational format and its ease of use allows our group to concentrate on what is important -- and it saves me time!" "PodKeeper is evidence that the best innovation often comes from improving something simple." Teachers can avoid paying out of pocket for school supplies because with PodKeeper, teachers can create a school supply wish list and ask parents to bring what the class needs. Teachers can post new lists throughout the year as they need more items. 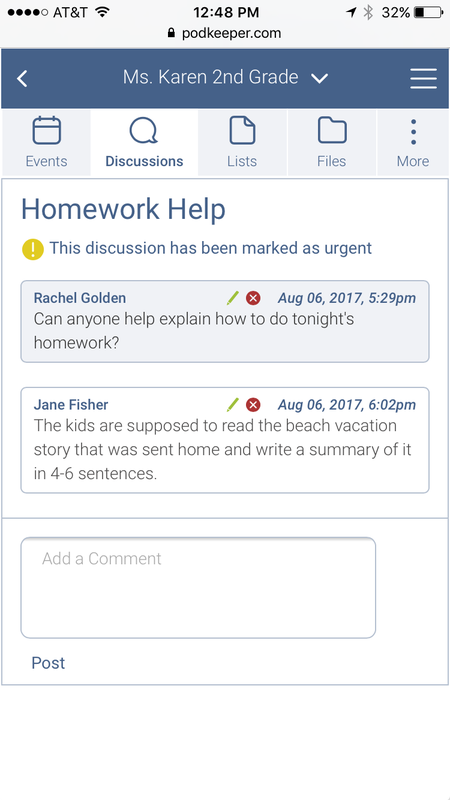 When a parent has a question about a homework assignment, they can ask the question in the Pod and any parent can respond with an answer. The burden doesn't always have to fall on you because now you have partners in effective classroom communication. Don't worry about printing notes to send home, or starting a new email chain. With PodKeeper you can quickly and easily send updates to all the parents, or select a sub-group of parents, with any information you want to share with them. Create a signup list to ask for parent volunteers to help out in the class. When it's time for parent-teacher conferences, create an online signup form, which is much easier for everyone, as parents don't have to come to the class to manually sign up. If parents need to change their time, they can make the change themselves without having to contact you. Using our Events feature, it's easy for everyone to find out about an upcoming event that's just for the class. You can even require an RSVP to keep track of attendees. If people are slow to respond, our system sends out reminders automatically so you don't have to. During a 15 minute call we will show you how PodKeeper works while you follow along on your computer, tablet or mobile phone. Have a lot of questions? No problem, we'll stay on the call with you for as long as needed until all of your questions get answered.